Here at Fisher’s Auto Service we know that you bought your hybrid vehicle because you care about the environment and the fact that you don’t have to fill up as often is a great fringe benefit. But Hybrids come with their own unique set of issues. These issues can lead your hybrid to not operate as efficiently as possible. Bring your Prius, Insight, CRZ, or other hybrid into our shop and we’ll make sure that it stays at it’s peak level of performance. We know you care about air quality and a high MPG. With regular maintenance we can help you keep your hybrid operating as efficiently as possible. If you’re not sure why your hybrid is “acting up” or just not driving as well as it used to, bring it on by and we will be happy to diagnose the issue. You don’t want to be driving your family around in a car you don’t trust, so let Fisher’s Auto Service take a look and we’ll get you back on the road as safely and quickly as possible. We can quickly diagnose any issue you might be experiencing with your hybrid. So if you have a check engine light on or need your brakes checked, we are here to help! Give us a call, drive on into our shop or conveniently schedule an appointment online for a day and time that works best for you! Diagnosing the issue right the first time is the quickest and most cost effective way to make sure that your hybrid is working properly to keep your emissions low and your MPG high. We can also check your battery. Proper battery maintenance is a must for hybrid owners as they are far more complicated and expensive compared to traditional car batteries. Let us be your hybrid experts and show the difference that our knowledge and experience can make when it comes to your auto repair and service experience. Maybe it’s not a major issue with your hybrid but an oil change you’ve been putting off or your check engine light is on. 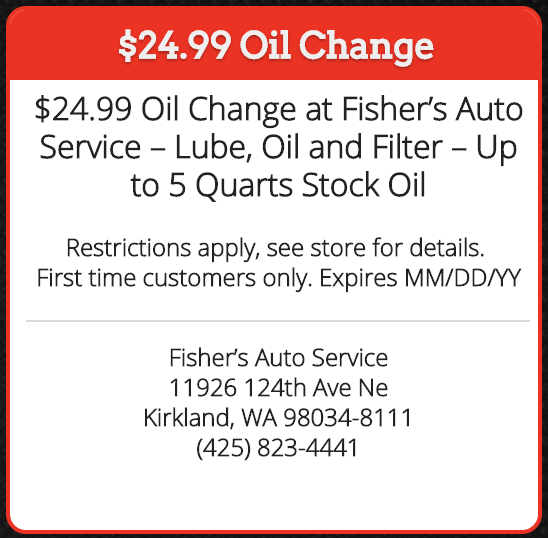 Put your mind at ease with Fisher’s Auto Service.